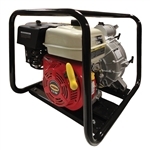 At Carroll Stream, we have the very best gas powered water pumps for commercial and residential applications. Our portable water pumps come with protective roll cages that also provide for easy transport and mounting. We have semi-trash and full-trash water pumps with gas motors powerful enough to remove flooded water or dredge lakes, and high-pressure water pumps that can quickly empty a large swimming pool or run a sprinkler system. These water pumps are versatile and can be operated using your standard hoses for the intake and discharge connections for fast, easy setup. Our gas powered portable water pumps deliver the power, efficiency and mobility you need to get the job done fast and are built to last. Shop our selection to find the perfect water pump, or contact us for help finding exactly what you need.